This paper presents the treatment of the spin-orbit interaction to calculate x-ray spectroscopies. 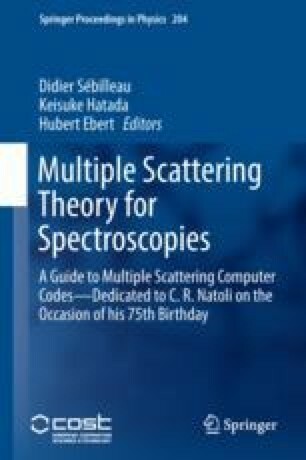 This term is here more specifically developed inside the Multiple Scattering Theory. We give the general paths resulting in a Schrödinger-like couple of equations, whose solutions are given in terms of \(\ell \), m, \(\sigma \) (spin) and s (solution) quantum numbers. The connection with the multiple scattering amplitudes is then given as well as the more general expression when dealing with complex self-energies. Finally the response functions for x-ray absorption near edge structure is given as it is implemented in the fdmnes code. Calogero R. Natoli is especially thanked for its teaching on MST, used in the fdmnes code. Particularly, he discovered independently from Wood and Boring the presented approach of spin-orbit and my knowledge on this subject directly comes from him.